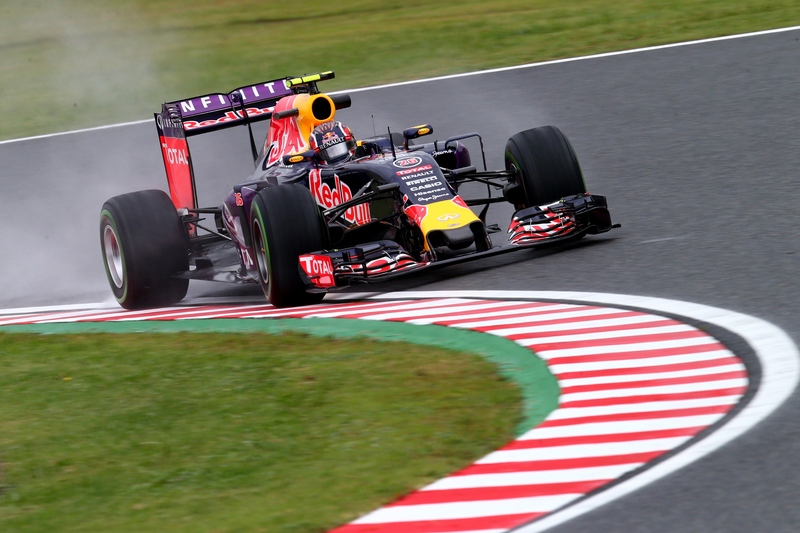 Carlos Sainz and Daniil Kvyat have topped the two Friday practice sessions for this weekend’s Formula One Japanese Grand Prix at Suzuka. The drivers had no opportunity to get in dry weather running, with the circuit bathed in rain from the start to finish of both 90 minute sessions. Limited running for the teams and drivers is always a given when a wet Friday practice session occurs. This was absolutely the case in Suzuka for practice 1. No drivers completed a flying lap until well over halfway through the session. It was Max Verstappen in the Toro Rosso who was the first to put himself on the leader-board with a 1’51.640. At the end of the session it would be his team-mate Carlos Sainz who sat at the top of the times after lowering the times to a 1’49.434. 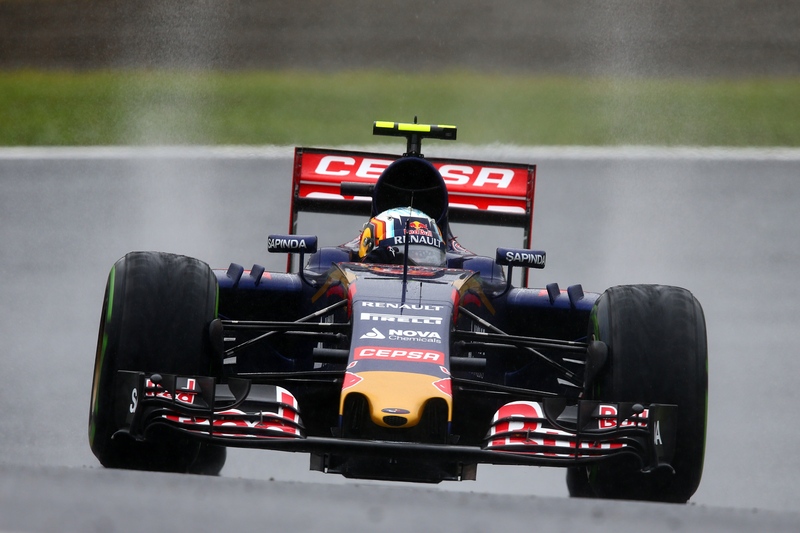 Sainz was half a second clear of Red Bull driver Daniil Kvyat, who was the only other driver under the 1’50 barrier. Nico Rosberg was 3rd fastest ahead of Singapore victor Sebastian Vettel and retiree Lewis Hamilton. The Silver Arrows pair are seeking to end any doubts that Vettel and Ferrari could challenge them in the latter stages of this season by having a strong weekend this time out. Rosberg and Hamilton were separated by 7 tenths of a second. 6th fastest was former session leader Max Verstappen ahead of Kimi Raikkonen’s Ferrari in 7th. 8th belonged to Felipe Massa, who become the first man to fall foul of the wet conditions after almost putting his Williams in the wall on the exit of Degner 2. Completing the top 10 was Marcus Ericcson and Valtteri Bottas, with only 2 more drivers on the board with a lap time. Felipe Nasr and Jenson Button were the final 2 runners, with the final 8 drivers not setting a lap-time due to the wet conditions. The limited running continued in practice 2 despite a promising start to the session. The drivers ventured out onto the track as it was drying up, allowing for some Intermediate tyre running. This wouldn’t last long however, as the rain soon built up once more, meaning that the final order was set pretty early on in the session as no improvement in time was possible. Daniil Kvyat, who also showed good wet weather pace in the first session, was the fastest driver at the end of practice 2. The Russian had been the first man to lay down a lap time before being beaten by over a second by Mercedes’ Nico Rosberg. Daniil would later come back out to set his fastest lap of a 1’48.277; 0.023 second quicker than Rosberg who would end the session 2nd fastest. 3rd fastest would go to the second Silver Arrow of Lewis Hamilton, who was struggling to match his team-mate in the wet conditions. He would later go on to say that he had learned absolutely nothing from the Friday practice sessions. In fact, his exact words were ‘diddly squat’. 4th and 5th fastest would go to former team-mates Daniel Ricciardo and Sebastian Vettel; with the pair separated by a whopping 1.1 second gap. Vettel was followed by current team-mate Kimi Raikkonen in 6th and then the two Toro Rosso drivers in 7th and 8th. Felipe Nasr and newly-resigned Lotus driver Pastor Maldonado completed the top 10. All but one driver set a lap time in the second practice session, with Valtteri Bottas the only driver not to do so after a mechanical issue befell his Williams.